Perfect Location for Currumbin ANZAC Day morning A perfect location for the reason we were staying. The room was spacious, we had three of us staying in a two bedroom apartment, lots of room to spread out. The bathroom was a little small but given it was a short stay, it didn't impact on the overall stay. The best on the goldy! 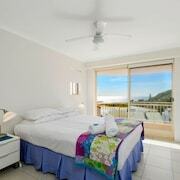 Beautifully appointed appartments, spectacular view, ideal location and superb hosts: what more could you ask for!!? Love your passport like it's your first-born? Feed that adventurous spirit and book a stay in Currumbin, 14 kilometres from central Gold Coast. Start making amazing memories (and taking some brag-worthy selfies) at Sea World, Dreamworld and Warner Bros. Movie World, just some of Gold Coast's famous sights. Visitors and locals alike love lazing about in Palm Beach Pirate Treasure Island Playground. After being on your feet all day, you won't have to travel far to find someplace to stay. cosy are some brilliant choices to look into nearby. 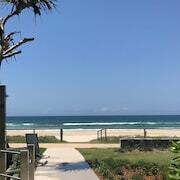 Spend an afternoon out at Tugun Beach and take a deep breath of the ocean air while you soak in the sun. 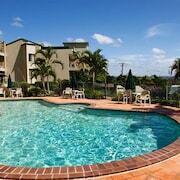 The hotels to look into near here are the Oceanside Resort and Sanctuary Lake Apartments. What else are holidays for if not breaking the bank? 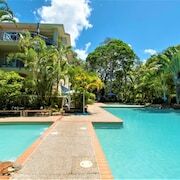 The Hill Apartments and The Rocks Resort are our picks for those travellers who aren't frightened of throwing down a little extra cash. Want to soak up the café culture? Dive into a trashy mag, sip on a steaming hot coffee and spoil yourself with some sweet treats at Cafe by the Bridge. When you start craving something heartier later, chow down on some grub at Allure on Currumbin Restaurant. Their tasty menu is certain to satisfy your grumbly tummy. If all that grub has left you feeling like a beer or two, Cafe Sanctuary is practically on the doorstep. It's an awesome place to grab a stool and get to know the locals! 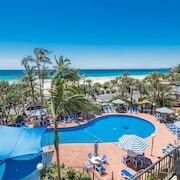 Don't stress if you can't snag the best Currumbin hotel. You'll discover more accommodation options nearby. 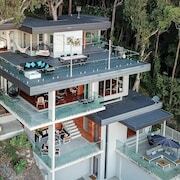 Tugun is around 2 kilometres from Currumbin, and Palm Beach is approximately 3 kilometres away. Whether you want your vacation in Currumbin to be chilled or brimming with jaw-dropping adventures, we'll be your guide! Just one or two more clicks and you'll be able to start stuffing your suitcase!